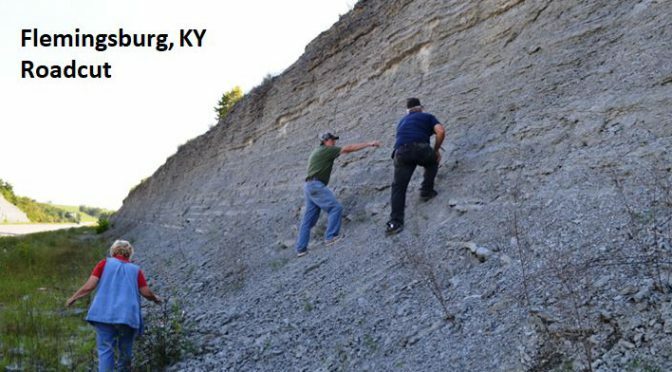 Yes, we are going all the way to Kentucky for a fossil location, specifically to a long, but fairly non-descript roadcut on State Route 11 in Flemingsburg. The site is on my radar because at least four members of WCGMC plan to collect at the site in late April. We will be doing so on a 4-day, 7-site trip led by Jerry Bastedo and the Buffalo Geological Society. But it is also a site WCGMC visited last Labor Day on its week long trip to Kentucky, Virginia, and Maryland. WCGMC visited the Flemingsburg roadcut last Labor Day en route to meeting CVGMC in central Kentucky. Most of the fossils we found were in the weathered talus that Linda is searching and not in the bedded strata that Ed and Glenn are exploring. Just as western New York is known for its wonderful diversity in Middle Devonian fossils, southwest Ohio, northern Kentucky and southeast Indiana are famous for their Ordovician invertebrate fossils As in New York, trilobites are arguably the prize, but there are diverse and abundant brachiopods, coral, gastropods, and cephalopods. But since the rocks are 65 million years older than our Middle Devonian (450 mya vs. 285 mya), the genera are completely different. The geography is different also. The best Middle Devonian exposures in western New York seem to be along creeks, particularly those draining into the Finger Lakes. Glacial cover is extensive and most road cuts do not extend to the Paleozoic bedrock. Given the absence of glacial cover and a bit more overall topography, road cuts all around the Cincinnati Arch expose the full Ordovician section and offer fossil hunters easy access. 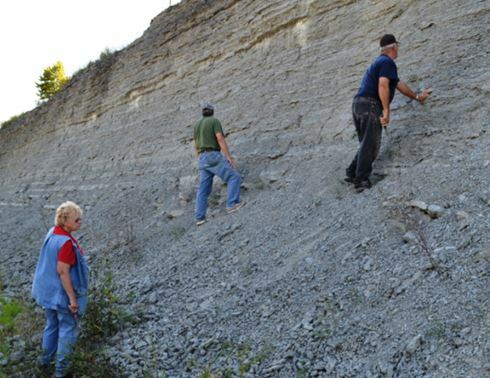 It is said that where there is a roadcut in the Cincinnati area there are fossils. The Flemingsburg site is about 80 miles southeast of Cincinnati and 3 miles south of Flemingsburg, Kentucky. The State Route 11 roadcuts are a little more than a decade old, the result of blasting during highway widening projects in 2005 and 2006. The rubbly-weathered shales and grain-supported limestones of the Corryville member of the Grant Lake Formation exposed by the road work contain the full suite of Upper Ordovician fossils for which the Cincinnati Arch region is known. Collectors have well over a quarter of a mile and perhaps a dozen separate roadcuts from which to collect. Full undamaged orthid brachiopods are probably the most prolific and evident invertebrate fossils weathering from the less resistant shaly limestones. Two genera dominate, Vindlandostrophia and Herbetella. Spend some time there and you will go home with many of both. Vindlandostrophia are interesting as the genus name is relatively new. These brachiopods used to be known as Platystrophia, however Zuykov and Harper (2007) re-assigned many to the genus Vinlandostrophia based on shell morphology (Hartsthorn et. al., 2016). There are at least three different species of Vinlandostrophia at the site, perhaps more. These are all Vindlandostrophia brachiopods. The larger one in the upper left is likely Vinlandostrophia ponderosa. I like the smaller one in the center on matrix. It may be hard to see, but the specimen above the quarter is a geodized brach with calcite crystals growing towards a hollow center. However I found two other fossils that also interested me. First, I like bryozoans (see April 2017 newsletter) and that phylum is well represented in the roadcut. Fan-like bryozoa called Constellaria sp. can be found and other species often coat the ubiquitous brachiopods. And then there are the Solenopora, which look like fossil brains, or at least they do to me. These often wrinkled and generally lumpy masses have long been thought to be calcareous red algae mounds and they may well be, but recently some researchers have proposed that they might be sponges. Brains or Solenopora? 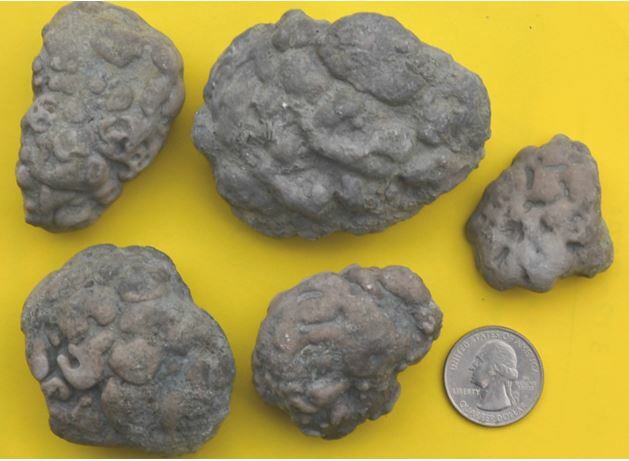 They may look like brains, but they are Solenopora and they were common in the loose material below Flemingsburg roadcut. Solenopora are neat in their brain-like external form, but they also have interesting internal structure. The internal layering polishes to display the growth structure. 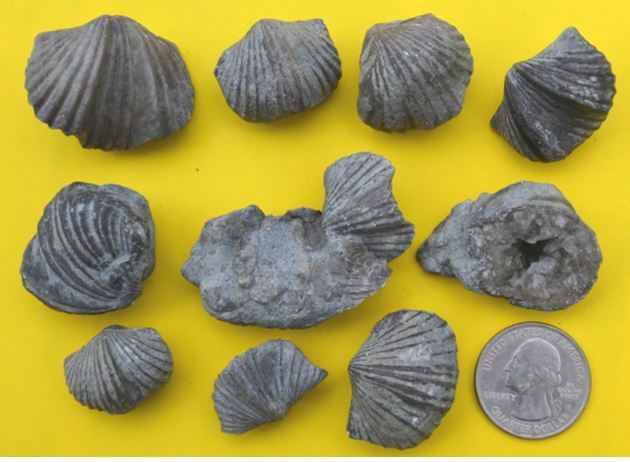 I will be looking for all of these and whatever else the Ordovician of northern Kentucky can offer on our trip in late April. Hartshorn, K.R., et. 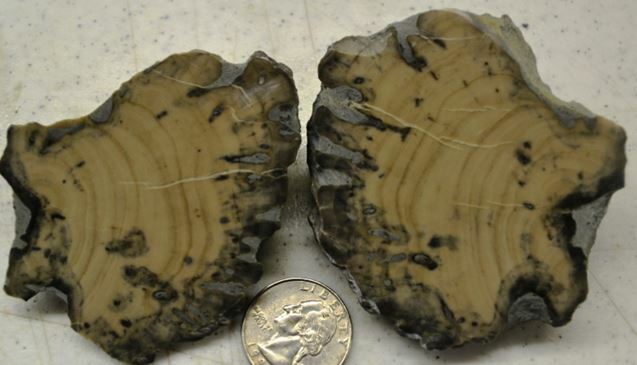 al., 2016, Dry Dredging the Cincinnati Arch: Field trip Guidebook, The Fossil Project, 40 p.
Zuykov, M., and Harper, D., 2007, Platystophis (Orthida) and new related Ordovician and Early Silurian brachiopod genera, Estonia Journal of Earth Science V. 56(1), 11-34.